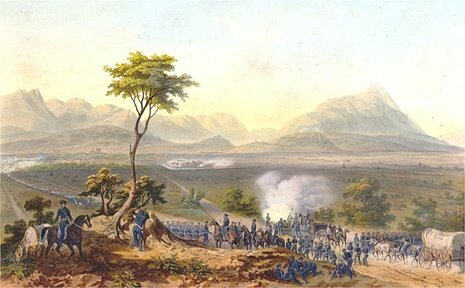 In the Battle of Monterrey (September 21–24, 1846) during the Mexican-American War, General Pedro de Ampudia and the Mexican Army of the North was defeated by U.S. forces under the command of Zachary Taylor. Led by Taylor, 2,300 U.S. troops crossed the Rio Grande (Rio Bravo) after some initial difficulties in obtaining river transport. 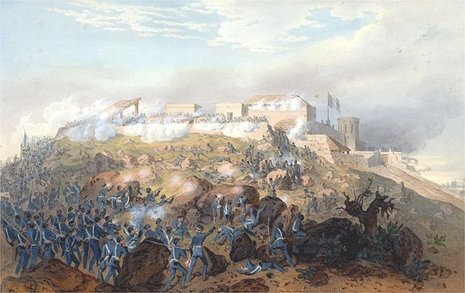 His soldiers occupied the city of Matamoros, then Camargo (where the soldiery suffered the first of many problems with disease) and then proceeded south and besieged the city of Monterrey. The hard-fought Battle of Monterrey resulted in serious losses on both sides. The American light artillery was ineffective against the stone fortifications of the city. The Mexican forces were under General Pedro de Ampudia. A U.S. infantry division and the Texas Rangers captured four hills to the west of the town and with them heavy cannon. That lent the U.S. soldiers the strength to storm the city from the west and east. Once in the city, U.S. soldiers fought house to house: each was cleared by throwing lighted shells, which worked like grenades.